An article looking at some tips and ideas to cut costs in your business without causing serious damage. In the face of the present financial climate, many businesses are forced to look at cutting costs. It never feels like a good position to be in but perhaps that is because of one word in the statement above. That word is ‘forced’. No one likes to feel that they are being forced to do anything, particularly when it comes to their own business, which they have built up over years and years of hard work. All too often, cost cutting decisions are put off because there is a fear that looking at the options will lead to laying off staff or even shutting part of the business down. The fact of the matter is, that there are probably lots of ways that your business can save money and the sooner you look at those options and put some into practice, the more likely it is that you will be able to avoid measures that are unpleasant or unpalatable. 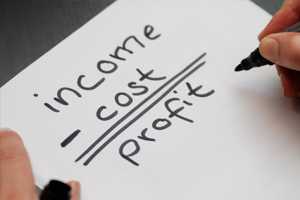 A business has two types of cost; fixed costs and variable costs. Fixed costs – or overheads – are those costs that you have every month no matter how much business you are doing. Variable costs are those that you only incur when you are working and so are usually covered by the profit margin earned on that specific project or sale. Ideally then, you want to cut the fixed costs or transfer as many of them as possible to variable costs. Much of your wage bill probably sits on the fixed cost side of that equation and it would be foolish to say that you should have people sitting around who aren’t doing anything or aren’t contributing to your business. On the other hand, without any staff, how much business could you actually do? The skills and experience, the talents and connections that your staff has are probably a cornerstone of your business. How easy will they be to replace when things pick up? Cutting costs to protect your business. Cost cutting exercises can seem like a negative thing – doing without and making do on less – but they are a positive step. You are protecting your business, protecting your people and putting yourself in a position where you will be more likely to benefit from a future economic upturn. Cutting costs in a way that doesn’t’ damage your business is the same as reducing waste. It’s the same as increasing profitability. Areas to look at to make some savings. Wasting energy is always wrong for lots of reasons so now is a good time to look at energy efficiency and being that bit greener. Turn off equipment when it’s not being used; that means everything from light bulbs and heaters to computers and printers. Set the thermostats a degree or two lower and make sure everything is turned off at night. Make sure everyone turns their computer off when they aren’t in the office. Use laptop computers rather than desktop models whenever possible; laptops use about 80% less energy. Look at your phone bills. You may well be able to save a good amount of money if you switch to a VoIP system. Voice-over-Internet-Protocol allows you to make calls over the Internet through services such as Skype. More and more businesses are turning to this cheaper alternative and it’s particularly good at saving you a lot of money when you make long distance and international calls. Transport is probably a significant factor in your business costs. You need to use a van or commercial vehicle for deliveries but does that same vehicle get used as the business run-about? If it does then doing those journeys – where you don’t need to be in the van – in a more economical car will save you money. One cost-cutting area too often forgotten is insurance. If you haven’t looked at your insurance prices in the last 12 months it’s time to shop around. That means fleet and vehicle insurance, premises insurance, in fact all the policies that your business is covered by. Everyone is feeling the pinch. Everyone needs the business; so always try and negotiate yourself a better deal. Whether you are talking to the people who print your business literature or the manager who looks after your business account, if you ask for a better deal you may well get one. There is an old adage, that if you look after the pennies then the pounds will look after themselves. Sometimes a saving can appear to be too small to be worth bothering with, but it isn’t. Every little counts. When you are thinking about where you can save money, ask all your staff for their ideas. They might notice things that you don’t see and you can be sure that they will understand what their motivation is to come up with good suggestions. Of course, this whole process is only about balancing money going out and money coming in. Income vs. expenditure. Try and avoid cutting anything that is making you money. Advertising and marketing budgets are easily cut but if your business becomes less visible or even invisible then how much income will you be able to generate. You still need to provide good customer service in order to keep up your businesses reputation. Cutting costs in the right way and in the right areas can lead to a leaner and better business, and there is nothing negative about that. We hope that this article has been of use to you. If you have any cost saving ideas or insights that you would like to share, then please use the comment box below to add them. The concept behind WetLeisure.co is to make business growth for those working in the industry a reality. If you follow WetLeisure on Twitter, you will get notifications on free business support articles or you can register on the site and join the groups and forums to share and benefit from industry knowledge.